On June 11th 2010, I launched a poetry contest to honor my father’s 101st anniversary. 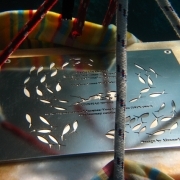 The winning poem was to be engraved on a memorial plaque and brought down to the Aegean seabed this summer. More than one hundred poems were submitted in the form of haikus and on the theme of the ocean. The voting took place on facebook: whichever poem received the most likes won. And it was a heated battle between Stephen Matadobra, Gilli Graham, and Jemfyr Tree. You can find these poems compiled in a free downloadable ebook. Photos by Pierre-Yves Cousteau, Eric Linders, Daniel Holmstedt, Alexander Reichardt and Jean-Bruno Marciacq. 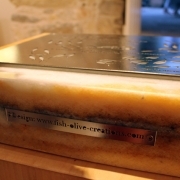 Immediately, I asked Alexander Reichardt, artist specialized in creating fish sculptures and motifs (http://www.fish-olive-creations.com/gallery.html), to design the memorial plaque. Alex accepted this and not only designed a wonderful display of fish surrounding the poem; he also found a unique and gorgeous Naxian marble base and a German company who laser engraved the design on a stainless steel plaque! August 2011. 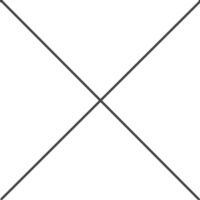 I fly to Naxos to meet Alex and attend the Axia festival, which brings together artists and scientists of international notoriety for a delightful week of cultural exchange on the Greek island of Naxos. I have no idea how he does it, but Alex manages to bring together good people. I mean GOOD people. Everyone I meet during this festival and my time in Naxos is inspiring, moving, true and genuine. I feel blessed for being in such company. I discover the stainless steel plaque, a beautiful incarnation of German precision crafting (http://www.gebrwolff.de). Carved with millimetric precision in a shiny sheet of metal that will withstand forever the erosion of the sea. Alone it weighs 7kg! 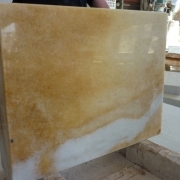 I visit the marble cutting workshop and meet with Yannis, Alex’s friend who owns the marble quarry and donated a beautiful 70kg polished bloc of the finest, quartz-incrusted Naxian marble (http://www.karpontinibros.gr/quarry.php?menu=21&lang=en). Together with the engineer of the worshop, Jorgos Kontopidis, who designed and built all the marble cutting machines they use, we fix the metal plaque first on a second sheet of stainless steel, and then on the massive marble piece. We celebrate this with homemade Naxian wine and a Greek salad. I learn that the people of Naxos have been working and shipping marble pieces throughout the world for over five thousand years! 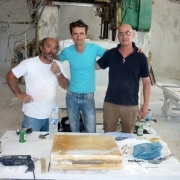 The memorial monument assembled, we carry it to Alex’s art gallery where it is exposed under a Cousteau Divers flag. 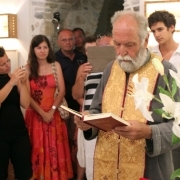 That evening, Papa Vasillis, the orthodox priest of the village gives a blessing for the plaque in loving memory of Jacques-Yves Cousteau, of whom he happens to be a huge fan! Nigel Shore, an oboist of international recognition, even plays a tune for the plaque. A few days later, Alex, Yannis and myself loaded the monument into the ferry and took it to the neighboring island of Santorini. I had spent one whole summer in Santorini, diving, training and working at Navy’s Waterworld dive center, two years ago. It was during this time that the idea of the Cousteau Divers program came to me: uniting the lovers of the sea to become its protectors. Mike, the owner had told me at the time he wanted to become a Cousteau Dive center, and I was now back on Santorini to make this come true. 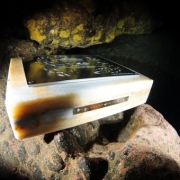 As soon as we arrived, we went out diving, searching for the best place to lay down the plaque. I already had a good idea of where I wanted to put it. 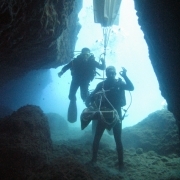 A small cave, rarely visited on the dive site (which is full of caves and fissures), carved into the solidified lava of the volcano’s previous eruption. When the Thira volcano erupted three thousand years ago, it was the biggest explosion in human history, wiping out the entire Minoan civilization. This cave is a bit dark and narrow, but its central room is sunlit, one hour a day, through an opening just beneath the surface. We look at each other and nod silently through our regulators. The next morning we return with the plaque. After lowering the plaque into the water with ropes, we fasten it to a lift bag and control its descent. 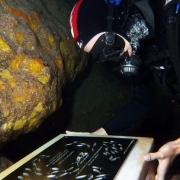 As we reach the entrance of the cave, Dannie, one of the Swedish instructors at Navy’s, removes his fins, releases the lift bag, and “moonwalks” the plaque into the cave, where it just so happens to fit perfectly in the sunlit spot of the cave. Grouped around the plaque, we open and drink a small bottle of champagne and admire this new monument to love for the ocean, and to my father’s amazing life. 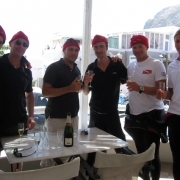 Once back at the newly “Cousteau-ified” dive center, we begin to work on how to protect the sea here, in Santorini. 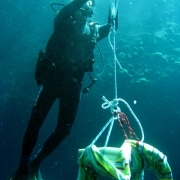 We spend a few dives collecting abandoned, but still active fishing nets. We use the Cousteau Divers survey to baseline the health of the dive sites. Cousteau Dive Centers around the world serve as permanent observatories of marine life and help to monitor and protect their dive sites, creating marine protected areas when possible. This is exactly what we decide to do, and in a couple of days, I meet with the maire of Santorini and with the director of the boatmen’s union, one of the most respected men of Santorini. Both of them vow to help me and the new Cousteau Dive Center establish a marine protected area on Santorini. I leave Greece with good hope for the future. Within just five years of protection, Santorini could have one of the best dive spots in the Mediterranean! More important, it can become a sanctuary where children of today and tomorrow can witness the beauty of nature and nourish their imagination with the extravagant display of untamed life that grows in unspoiled places. And with every new Cousteau Dive Center it will be a new adventure, a different battle for the same purpose: to protect life, in all its forms, everywhere on earth. The journey continues. “Today, in these solitudes of the sea, man must create sanctuaries against himself.” Jacques-Yves Cousteau, 1979. Pierre-Yves Cousteau, from Paris, September 8th 2011.